There are two reasons to visit NYCC. One, unsurprisingly, is its mammoth slices of cheesecake, flown directly from New York, and capable of satisfying three people (at the very least.) But good cheesecake can be had in any number of places across the city. Its other draw is a little more unique: the equally mountainous double-decker pastrami sandwiches. Gloriously succulent, smoky meat paired with potent mustard and held between soft, fresh bread will have you digging in long after your stomach reaches maximum capacity. Décor-wise, NYCC has little to offer in the way of frills. There’s a small counter with a chiller display of the various desserts (at which you place your order), a pinboard of celebrity clientele, and a smattering of tables both indoors and outside. Although after all that meat and sugar consumption, air conditioning is advised. 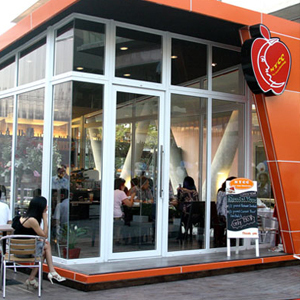 At Crystal Design Center (CDC) look for the small orange pop-up building between buildings D & B. A taste of the big apple, flown in fresh.